October 15, 2012 - Scientists and flight crew members with Operation IceBridge, NASA's airborne mission to study Earth's changing polar ice, are beginning another campaign over Antarctica. Now in its fourth year, IceBridge's return to the Antarctic comes almost a year after the discovery of a large rift in the continent's Pine Island Glacier. The first science flight of the campaign began Friday at 8 a.m. EDT when NASA's DC-8 research aircraft left Punta Arenas, Chile, for an 11-hour flight that will take it over the Thwaites Glacier in west Antarctica. This year, IceBridge will survey previously unmeasured areas of land and sea ice and gather further data on rapidly changing areas like Pine Island Glacier. The IceBridge Antarctic campaign will operate out of Punta Arenas through mid-November. Several of IceBridge's planned flights focus on previously unmeasured ice streams feeding into the Weddell Sea. These flights will gather data on what lies beneath these ice streams, something vital for understanding how changing conditions might affect the flow of ice into the ocean and sea-level rise. "We have added surveys of ice streams flowing into the Ronne and Filchner ice shelves," said IceBridge project scientist Michael Studinger at NASA's Goddard Spaceflight Center in Greenbelt, Md. "This is something we haven't done before." The large crack in Pine Island Glacier's floating ice shelf has been the focus of worldwide attention as it has grown. The ice shelf now threatens to calve, or break off, a large iceberg into Pine Island Bay in the Amundsen Sea. Researchers have been using imagery from NASA's Aqua and Terra spacecraft and synthetic aperture radar data from the German Aerospace Center's TerraSAR-X satellite to monitor the rift since its discovery last year. IceBridge also will gather data on sea ice in the Weddell and Bellingshausen seas. Because of geographical differences, Antarctic sea ice behaves differently from ice in the Arctic and presents unique challenges. "Sea ice in the Antarctic is a very different physical system," Goddard sea ice researcher Nathan Kurtz said. Ocean currents, precipitation patterns and the shape of land masses are just a few of the differences. Instead of compacting ice against land like in the Arctic basin, currents in the Southern Ocean push much of it farther out to sea. Also, the Antarctic averages more snowfall, which weighs sea ice down and allows ocean water into the bottom layer of the snow on top of the sea ice. The Antarctic has more frequent strong wind events and large temperature swings than the Arctic, which causes layers of ice to form in snow cover. Both of these factors make getting accurate readings of snow on top of sea ice challenging. Arctic sea ice extent and volume reached record lows this year, but Antarctic sea ice volume has been holding steady and the extent has been increasing. Predictive models have a hard time pinpointing what Antarctic sea ice might do under a warming global climate. Having more data to work with could make these models more useful. Further observations will give researchers more data on how Antarctic sea ice changes over time. "This is why having observations is really important," Kurtz said. "We want to make sure these models are getting the physics right. IceBridge will gather information on many different aspects of land and sea ice using a variety of scientific sensors onboard the DC-8. These instruments include a laser altimeter to measure surface elevation changes, various radar instruments for determining snow depth and ice thickness, a gravimeter that will gather data on the size and shape of water cavities under ice shelves, and a digital camera instrument that takes high-resolution images useful for building maps and digital elevation models of the ice. By flying previously surveyed tracks in rapidly changing areas like Pine Island Glacier, IceBridge is building on a legacy of measurements started by NASA's ICESat satellite that will continue with the launch of ICESat-2 in 2016. "This area is changing so rapidly we need to survey every year," Studinger said. In addition, IceBridge will fly along tracks for the European Space Agency's ice-monitoring satellite, CryoSat-2. This year's campaign also will see visits to IceBridge by school teachers. Two English-speaking Chilean science teachers will meet with IceBridge scientists and instrument operators this month and ride on a survey flight to learn more about polar science research with the goal of using their new knowledge to better engage and teach students. The IceBridge project science office is based at Goddard. 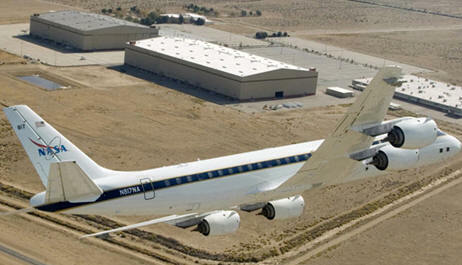 The DC-8 is based at NASA's Dryden Aircraft Operations Facility in Palmdale, Calif.